On Sunday, the second day of our activity, we departed from Eboshi-so at 8:30 a.m. and headed toward Noda Junior High School by bus. We joined the other volunteers who had come from Kariwa Village at the community hall of the temporary housing that located on the Noda Junior High School ground. First, we introduced ourselves and then we announced the schedule for the day. We worked in three teams for the whole morning. One team cleaned up after yesterday’s activity in Izumizawa; another team prepared for a nabe (Japanese-style hot pot dish) party for lunch; and a third team delivered the cookies donated by Bourbon to the residents in the temporary housing at Noda Junior High School. It was a very chilly day, but everybody worked energetically. As for delivering Bourbon cookies, a volunteer from Kariwa and Kwansei Gakuin University in Nishinomiya, Hyogo prefecture, each formed a pair (8 pairs in total) to deliver them from door to door. The purpose was not just to deliver the cookies. The primary purpose was to listen to the stories of people who live in the temporary housing. People from Kariwa had recently experienced the Chuetsu-oki Earthquake in 2007. Perhaps that created a sense of affinity between them and the tsunami victims. The volunteers told us later that the residents at temporary housing talked heartily to them about their experiences with the tsunami. At the community hall, we prepared for a nabe party, which was also the Christmas lunch. The volunteers and the residents at the temporary housing cut vegetables together, such as hakusai (Chinese cabbage) and green onion, which were brought by the volunteers from Kariwa Village. The residents at the temporary housing also provided other cooking ingredients. We also cooked rice in a big rice cooker. As the Kariwa group had to leave around 11:30 a.m., we all took a picture in front of the community hall. At noon, the nabe party started. First, Mr. Nakano, chairperson of the residents’ association of the Noda Junior High School temporary housing, made a speech. Then we sat around the 8 nabe pots and enjoyed the party. The number of participants was 42 in total; 25 residents and 17 volunteers. It was a big nabeparty. Many of the residents of the temporary housing happily told us things like, “It’s been a long time since I last had nabe”, or, “Eating with many people makes the food taste even more delicious.” We felt we had a heart-warming social gathering in a friendly atmosphere. After the nabe party, from about 13:40, two programs were carried out. NVNAD organized an activity to make a Christmas tree using pine cones, and Uegahara Habitat, a volunteer group of Kwansei Gakuin University showed everyone how to create Christmas tree decorations and lanterns. We were impressed that everybody concentrated hard on their activities while enjoying themselves. Then, we finally started the long-awaited bingo game at 14:40. Just as the bingo game we had in Izumizawa the day before, everybody got very excited and we heard cheerful voices every time someone got bingo. The most popular prize was the ceramic bowls donated by Fellicimo, a catalog retailer. Especially the elderly people loved them. We were very happy that everybody seemed to enjoy the bingo game. The bingo game finished at 15:40. At the end of the event, we lit the hand-made lanterns that everyone had just made and illuminated the Christmas tree. We all admired the glowing lanterns and the twinkling tree for a while. Then we gave a round of applause and called it a day. It was really a short visit, but we hope the residents of the temporary housing at Noda Junior High School will have fond memories about it. The two days at Noda village quickly passed, but we were happy to meet many new people and expand our network of friendship. 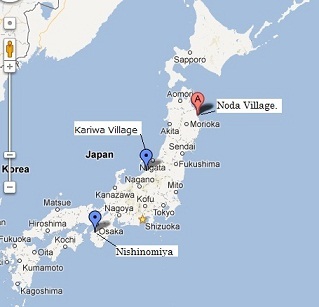 We would like to thank the people at both Izumizawa and Noda Junior High School temporary housing sites. We are looking forward to seeing them again.